A new, very heavy cropping variety, Glen Moy is an early variety raised from a cross between Glen Clova, Lloyd George and Malling Landmark. The canes are numerous, completely spine free and erect, making picking more comfortable. Heavy cropping and easily picked from the very short, compact fruiting laterals, the medium red fruits are large and moderately firm with an excellent flavour. Glen Moy has excellent virus resistance including resistance to Amphorophora Idaei, which is the main vector of virus. 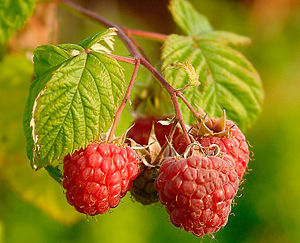 One of the first spine free raspberry cultivars and an excellent early variety that is ideal for dessert and freezing. With its flavourful fruits produced in abundance, erect growth, spine free canes, and virus resistance, Glen Moy is an excellent addition to our list of varieties. Raised by the Scottish Crop Research Institute.